Yes life certainly is doingt its level best to come between me and a little computer/blogging time, I uploaded to my photoblog for the first time in a week today! 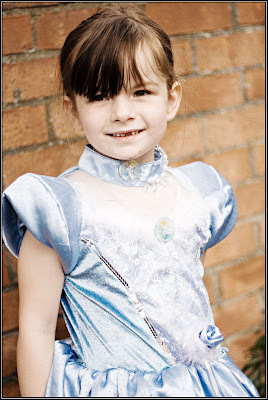 This photo of Abigail was from our Princess Portraits session and I've only just gotten round to editing it now. Mind you just in case any future clients are looking in, I'm still speeding through those ones, I did a turnaround of less than 24 hours last week for the school photographs, yes you know the ones, I would love to show you some of them but hey ho thats the way life goes when you're photographing other peoples children. Paul is doing immensely well with the gardening and it looks like that 5 year plan to buy our first house may just come to fruition, how cool would that be, especially when you think we pay £65 in rent to the council every single week and see no return. Anyway it's a bank holiday weekend and the children are off to stay with grandad Norman at around 2pm this afternoon, what will hubby and I do with ourselves, well we did try and book some cinema tickets but to be honest we couldn't agree on a movie at all so it looks like we'll have to revert to plan B, sadly plan B doesn't actually exist yet!! Next week is crazy busy once again so if you don't hear from me for a while don't think the aliens have gotten me again (did I tell you about the time when they did???) I'm just crazily trying to co-ordinate the family, the businesses and occasional bouts of sleeping!